Everyone enjoys spring gardens, with the fresh foliage and colorful flowers that lift our spirits after a long, dull winter. 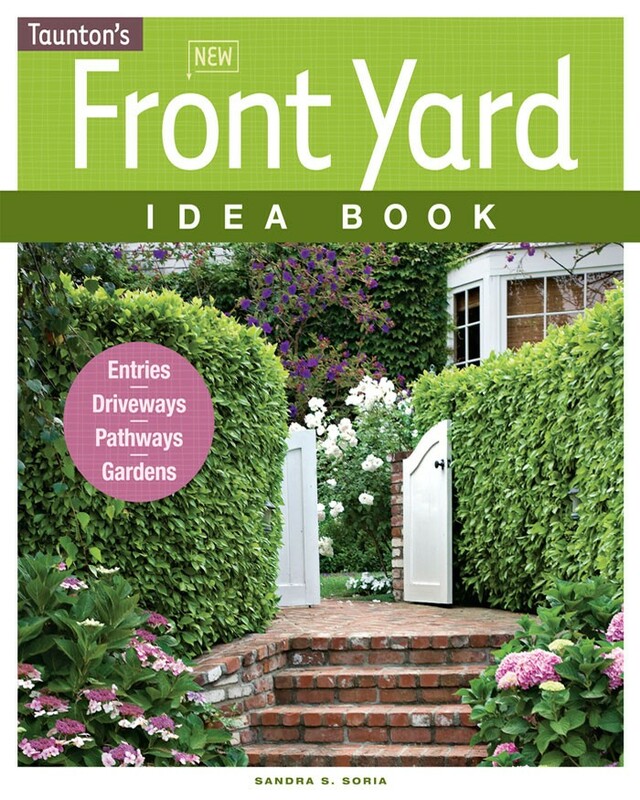 And summer gardens are glorious, of course, with an abundance of bold blooms and rich colors that perfectly suit outdoor summer activities. By August, though, heat and dry spells take their toll on spring and summer perennials; gardens can look tired and tattered. Time to retreat indoors? No way. 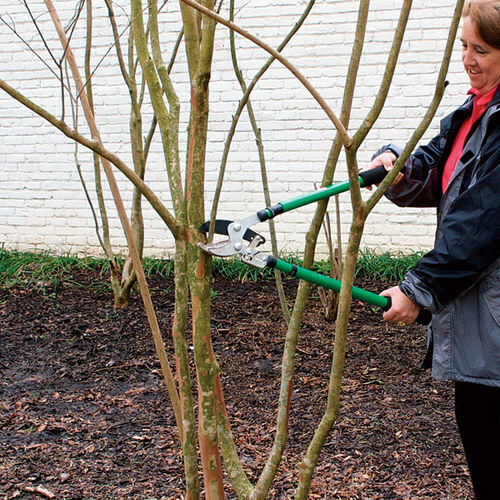 If you tweak a few of your plant choices and do a little strategic summer pruning, you can enjoy several months of autumn interest with little extra effort. 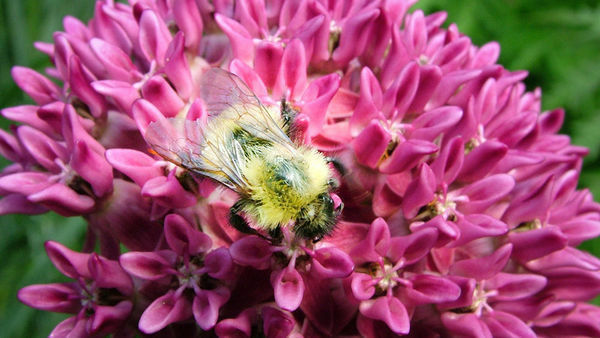 Incorporate late-blooming and repeat-blooming perennials, but be sure to plant them much earlier so that they can develop in place and be in full, natural-looking glory by autumn. 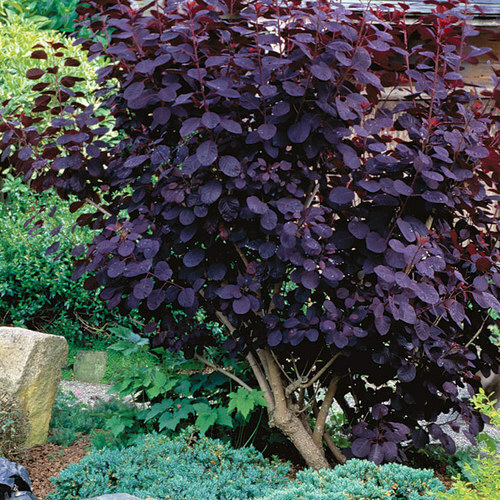 Choose shrubs and trees that are known for their colorful fall foliage as well as plants that produce berries and seed heads that extend interest beyond their blooms. With so many great features to work with, building autumn attraction is surprisingly simple. 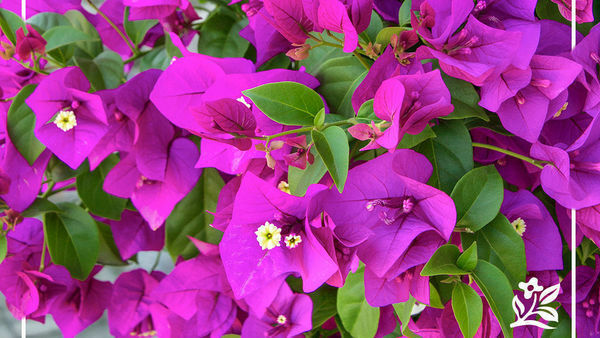 Plant long-lasting combinations. 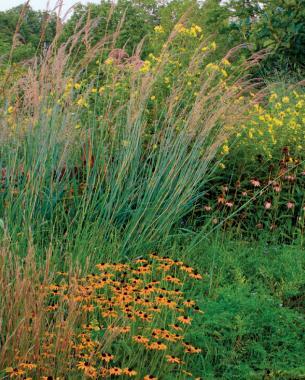 Long-blooming perennials, like cone­flowers, are perfect partners for showy fall grasses, such as ‘Sioux Blue’ Indian grass. 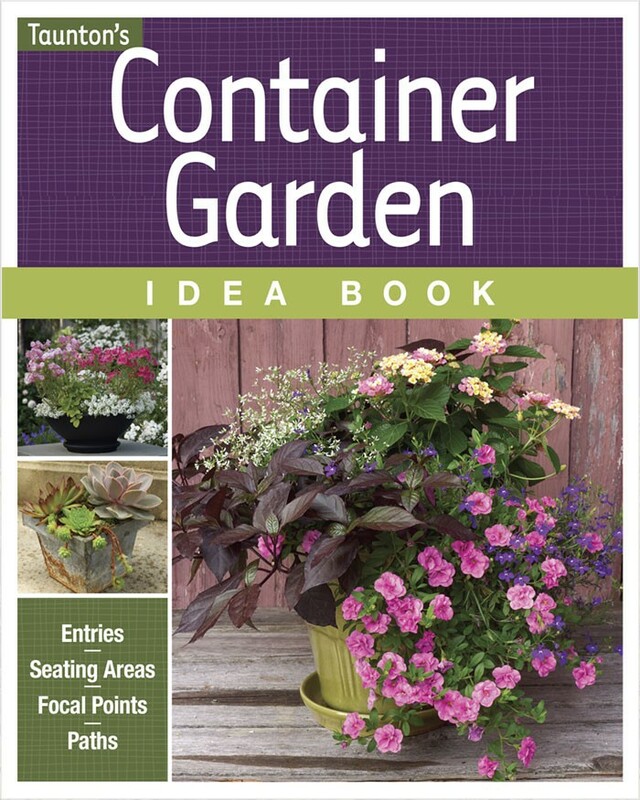 Plant shopping is a delightful part of the whole spring-gardening experience. 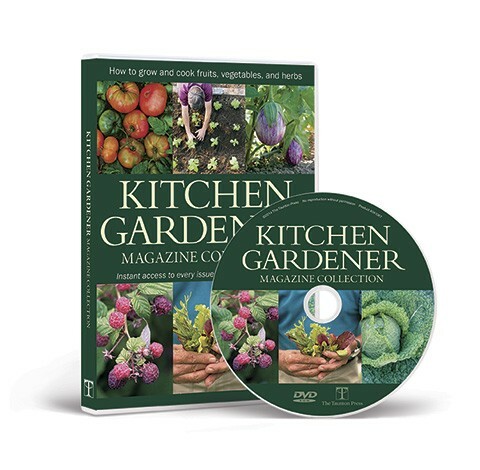 But if you hit the garden centers only in April, you’re going to end up with plenty of perennials that are at their peak early in the growing season. 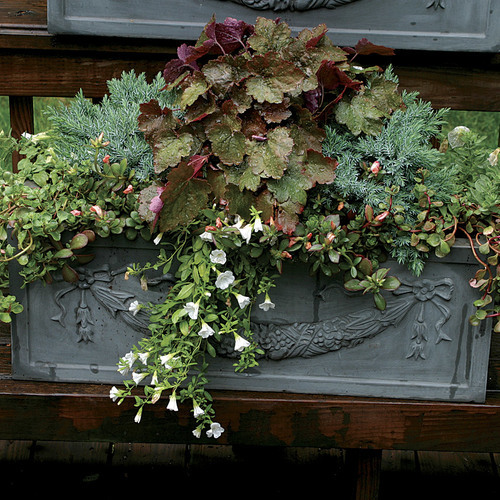 Some of the best late bloomers are slow to come up in spring, so they tend to look somewhat scrawny in pots and aren’t nearly as appealing to shoppers as flower-filled early bloomers. 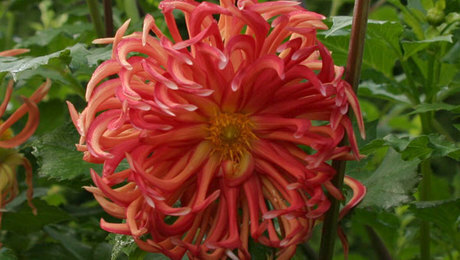 They can look so bad, in fact, that some nurseries don’t even set them out for sale until the spring rush has slowed. 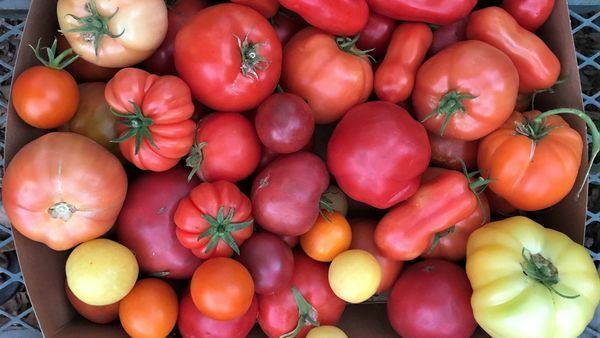 To make sure you score some later bloomers, plan on a second trip to your favorite plant-shopping place in late spring or early summer. 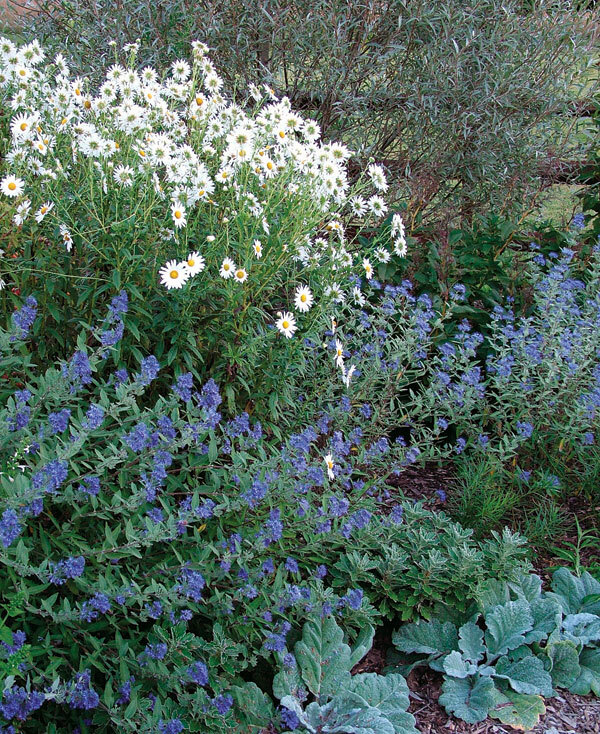 Even then, though, you may not find some of the more out-of-the-ordinary autumn perennials, such as leucanthemella (Leucanthemella serotina, USDA Hardiness Zones 4–9) and golden lace (Patrinia scabiosifolia, Zones 5–8); ordering through the mail may be your best option in this case. Watching the developing buds of these and other late-blooming perennials continues the anticipation that makes spring and summer so exciting. And when they finally do open, the new flowers give freshness to fall combinations. Golden lace and leucanthemella are late-blooming perennials, which will add fresh sparks of color to fall plantings. 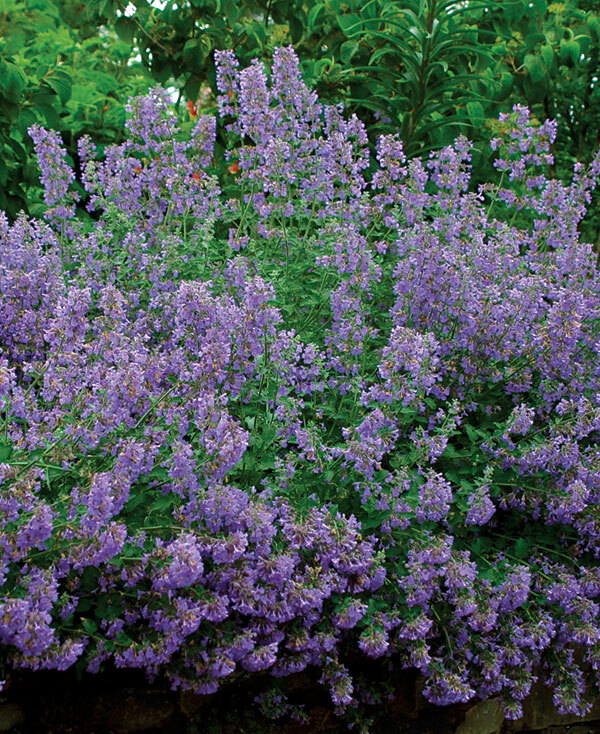 Other plants, like catmint , rebloom in fall and add a cool splash to season-finale combos. 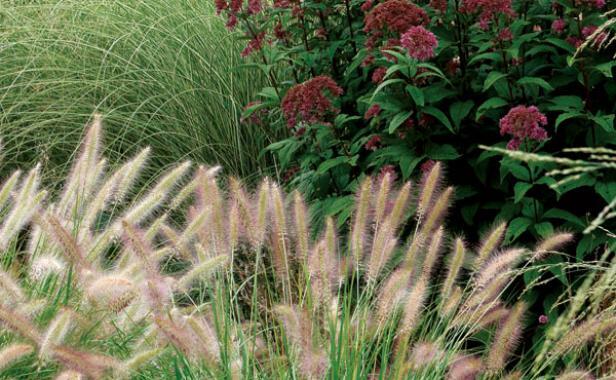 Combine color and texture: Delicate grasses, like ‘Morning Light’ miscanthus and ‘Cassian’ dwarf fountain grass, highlight the bold ‘Little Joe’ Joe Pye weed . 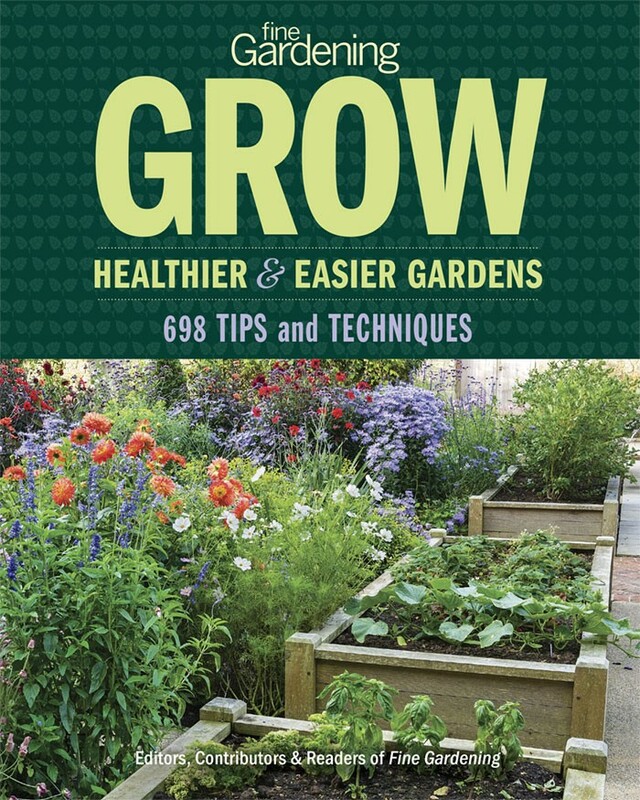 Gearing your garden toward fall interest, though, doesn’t mean you have to wait months for flowers. A fair number of common peren­nials start blooming early in the growing season, then continue their show into the autumn months. Some of them, such as orange coneflower (Rudbeckia spp. 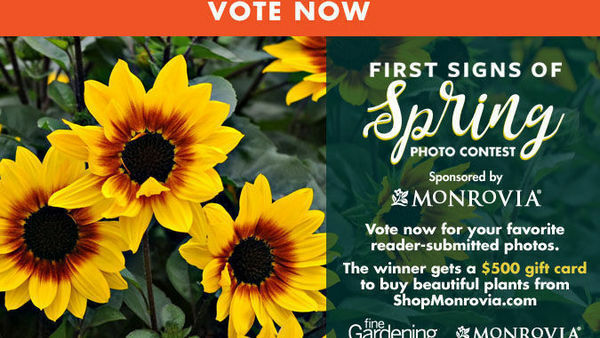 and cvs., Zones 3–11), perennial sunflower (Helianthus spp. and cvs., Zones 5–9), and purple coneflower (Echinacea purpurea and cvs., Zones 3–9), naturally bloom over an extended period. Others, such as catmint (Nepeta spp. and cvs., Zones 3–8) and some pinks (Dianthus spp. 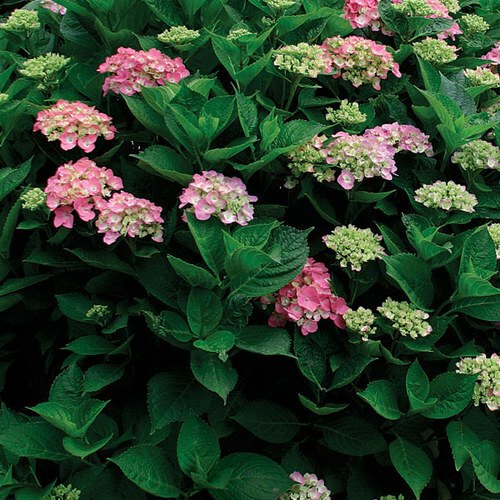 and cvs., Zones 3–10), put on their main flush of flowers in late spring to midsummer, then rebloom when cooler weather returns, especially if you give them a trim once their summer show fades. 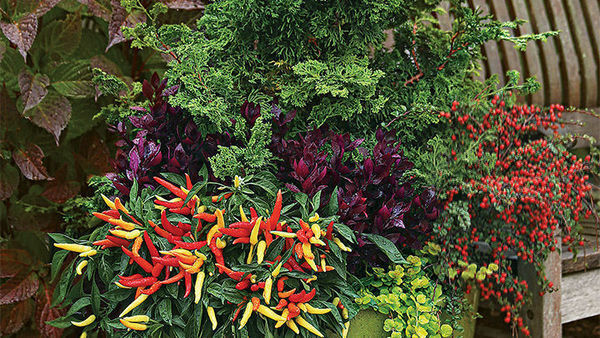 Late-blooming flowers are the gems of the fall garden, but—as with any season—you don’t want to depend on them alone for spectacular combinations. 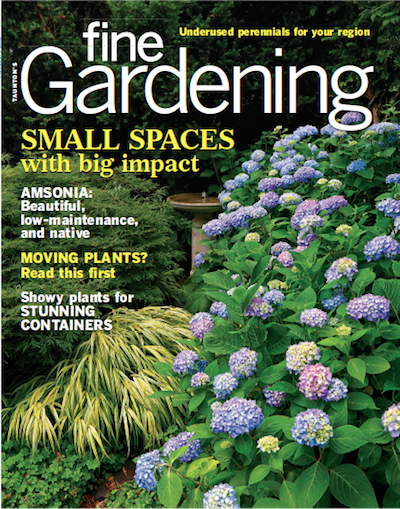 Fall-flowering perennials are sturdy plants, on the whole, but they, too, may suffer during weather extremes: Late-summer storms can bend or break tall stems, extended dry spells can damage developing buds, and unusually early frosts can cut short the show or prevent blooms from opening. 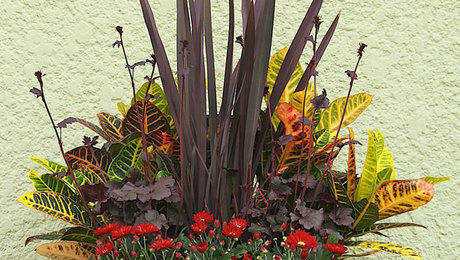 Pairing fall flowers with great-looking leaves improves your odds of creating successful combinations. If the weather cooperates, you’ll have both flowers and foliage to enjoy; if not, you’ll have at least the leaves to look at. 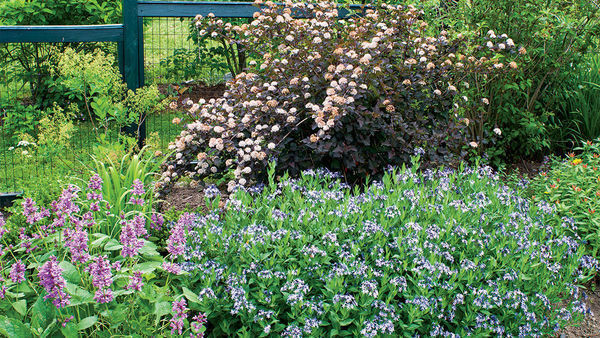 Perennials with nongreen foliage are workhorses, providing dependable color for months as the flowers come and go. 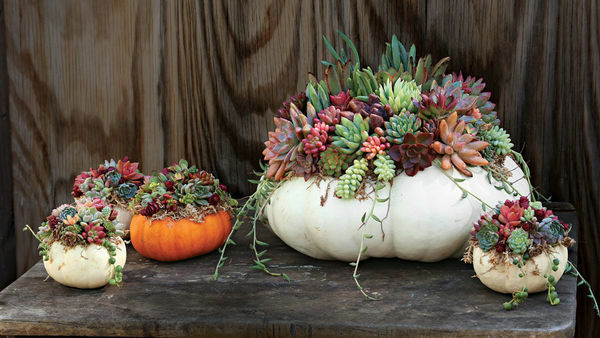 Even though they look pretty much the same throughout the growing season, you can change the color themes around them. You could, for instance, pair the bright yellow foliage of ‘Aztec Gold’ veronica (Veronica prostrata ‘Aztec Gold’, Zones 5–8) with purple tulips in spring, orange or red yarrow (Achillea spp. and cvs., Zones 3–9) in summer, and rich blue leadwort (Ceratostigma plumbaginoides, Zones 5–9) in fall. 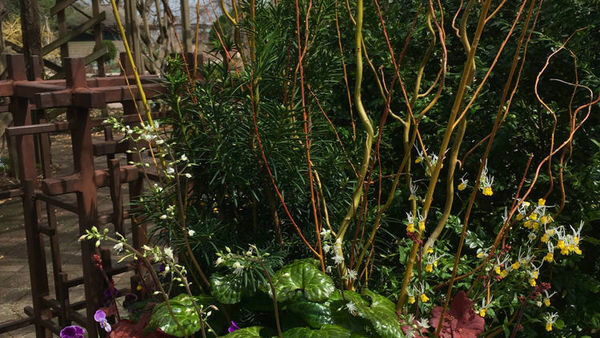 In any season, yellow- and purple-leaved perennials are perfect partners for other rich flower and foliage colors, while silvers, grays, and blues can be excellent companions for pastel-flowered perennials. 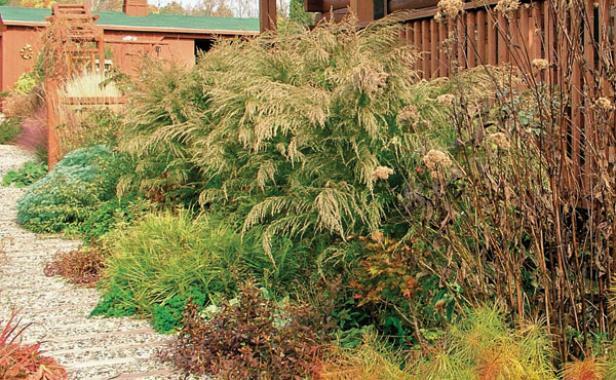 Fall color change is a common feature of decid­uous trees and shrubs, and a surprising number of perennials also offer this bonus foliage feature. Bright to buttery yellows—as with amsonia (Amsonia spp. 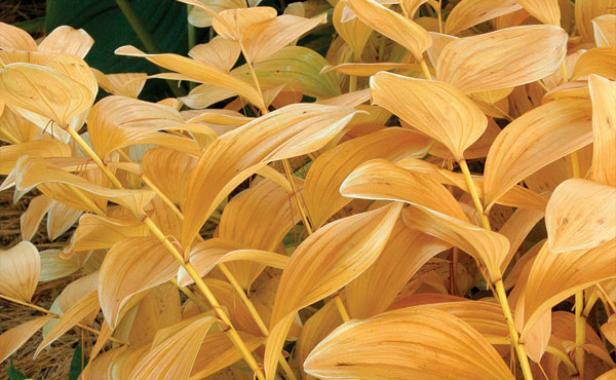 and cvs., Zones 3–10), Solomon’s seal (Polygon­atum odoratum and cvs., Zones 3–8), and purple moor grass (Molinia caerulea, Zones 5–9)—are among the most common fall colors, but you can also find copper, orange, and a range of reds. Admittedly, fall color can be somewhat unpredictable, depending on weather conditions and the plant’s location.A particular perennial growing in full sun, for instance, may show more intense fall leaf color than the same plant growing in some shade. Cloudy or rainy weather also may prevent vivid foliage colors from developing. Still, this color change can be so stunning that it’s worth considering when creating autumn combinations. Create graceful transitions. Showcase seed heads with a fall backdrop, like dog fennel. 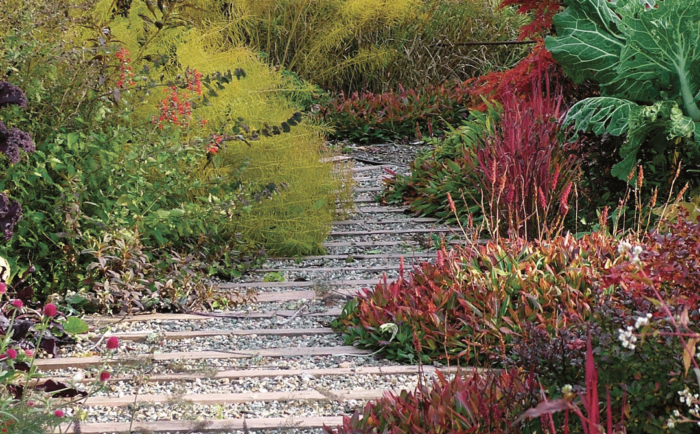 The vibrant fall color of plants like amsonia (in front) distract the eye from less-attractive expiring foliage. Rich greens, such as those seen in the leaves of hybrid hellebores (Helleborus × hybridus cvs., Zones 6–9) and stinking hellebore (Helleborus foetidus , Zones 6–9), are also a great addition to fall borders because they add a look of lushness, which is often missing from late-season gardens. Perennials that are cut back after their summer bloom can also make a significant contribution in this way. 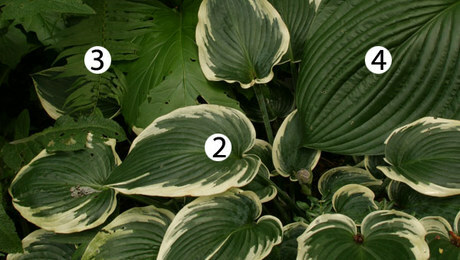 Even if they don’t flower again in fall, at least you have fresh-looking foliage to complement the other leaf and flower colors. When the petals of giant coneflower fall away, they leave a lovely seed head behind. 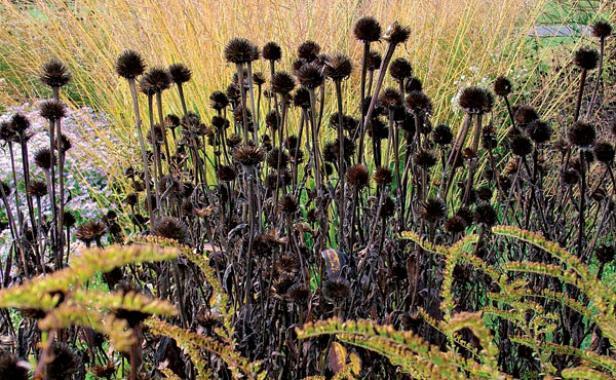 Gardeners interested in extending their beautiful border displays into autumn have yet another intriguing feature to consider when planning fall combinations: seed heads. These structures come in a wide variety of shapes, such as lacy, as with astilbe (Astilbe spp. and cvs., Zones 3–8); spiky, as with Culver’s root (Veronicastrum virginicum, Zones 4–8); and buttonlike, as with orange coneflower. 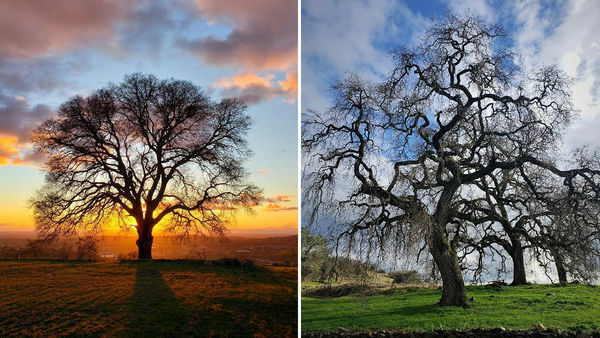 These and other shapes are especially interesting later in fall and into winter, when the bright flower and foliage colors have muted into browns and blacks and the forms of the remaining stems and seed heads are more noticeable. With a few exceptions, such as the bright scarlet seeds of gladwyn iris ( Iris foetidissima , Zones 4–9), seed heads aren’t colorful. They generally turn shades of tan, copper, or brown as they age. 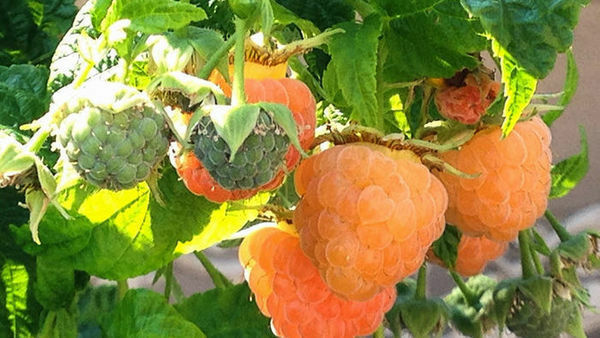 These harvest colors fit the season and can look great with flowers and foliage in a range of reds, purples, rusty orange, and golden yellow. If you’re feeling adventurous, you could crank up the color impact of your favorite seed heads with a light touch of spray paint. Admittedly, it can take some time to develop an appreciation for the beautiful forms and muted colors that many seed heads have to offer. 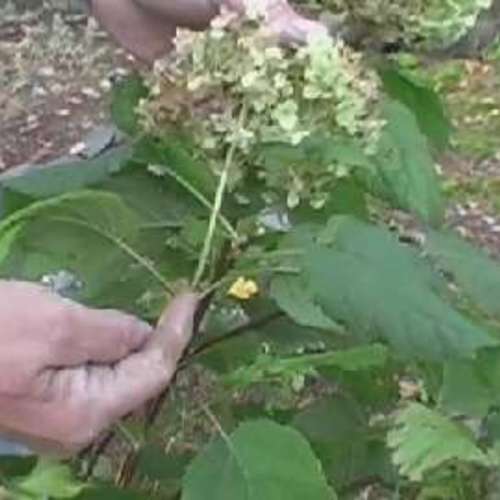 We’re advised so often to snip off the flowers of our perennials as soon as they fade, with the idea of removing those “ugly” seed heads and possibly promoting rebloom. 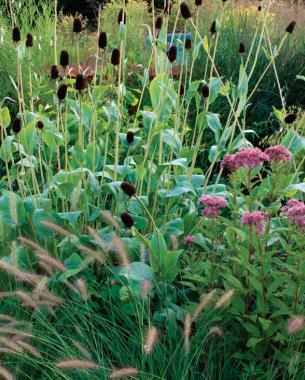 That’s generally a good idea in spring and part of the summer, but as the season winds down, leaving the seed heads allows you more time to enjoy the beauty of the border and also provides an abundance of seed for hungry birds. The downside of leaving seed heads in place is that the seeds the birds miss can fall to the ground and sprout in spring. 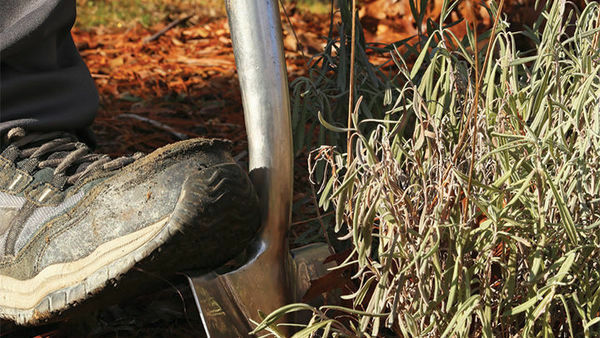 A few seedlings may be welcome, but if you find that certain perennials self-sow too freely under your conditions, applying a 1- to 2-inch-deep layer of mulch each spring may discourage many of these volunteers. 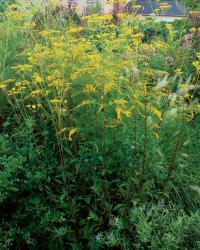 If that doesn’t work or isn’t a practical option for your garden, then you may need to remove the devel­oping seed heads of those problem perennials before they mature.